Samuel Mullet Sr. is one of 16 Amish charged with federal hate crimes in last year's beard-cutting attacks. Sixteen members of a breakaway Amish community in rural eastern Ohio, including its leader, were convicted of federal hate crimes Thursday for the forcible cutting of Amish men's beards and Amish women's hair. 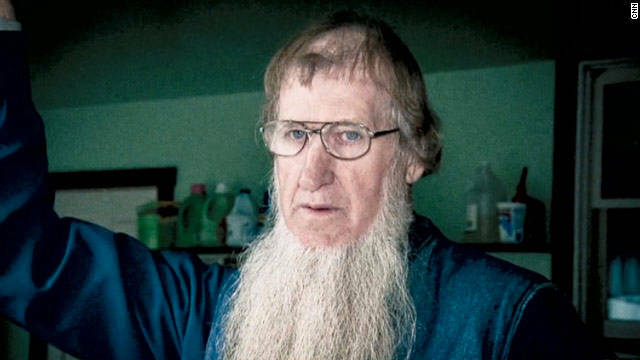 Prosecutors said the 15 followers, at Mullet's instruction, shaved the beards and cut the hair of Amish people who had left his group over various religious disagreements. Five attacks happened in four Ohio counties between September and November 2011, authorities said. While the charges can carry a sentence of up to life in prison, the judge can choose any length, and the federal guidelines in this case is probably about 17.5 years, said Mike Tobin, spokesman for the U.S. attorney's office. Mullet, a bishop of a group living on a compound outside Bergholz in eastern Ohio, wanted to "seek revenge and punish the departing families," according to an FBI affidavit filed before the trial. The attackers, using scissors and battery-powered clippers, injured their victims as well as others who tried to stop the attacks, prosecutors said. Usually, the Amish resolve disputes without involving law enforcement, but some Amish members reported the beard-cutting incidents to police last fall. Mullet’s group, which had broken away from a larger Amish community, is made up primarily of his relatives living on and around an 800-acre compound in a remote valley outside Bergholz. The jury also convicted various groupings of defendants with separate assaults, and Mullet and Lester Mullet with concealing or attempting to conceal items of evidence, including a camera and pictures of the attacks, the U.S. attorney's office said. The 16 defendants were: Samuel Mullet Sr., 66; Johnny S. Mullet, 39; Daniel S. Mullet, 38; Levi F. Miller, 54; Eli M. Miller, 32; Emanuel Shrock; Lester Miller, 37; Raymond Miller, 27; Freeman Burkholder, 31; Anna Miller; Linda Shrock; Lester Mullet; Elizabeth A. Miller; Emma J. Miller; Kathryn Miller; and Lovina Miller, 32. All live in Bergholz, except for Raymond Miller, Burkholder, Elizabeth Miller and Kathryn Miller, who are of Irondale, Ohio; and Lester Mullet, who is of Hammondsville, Ohio. - CNN's Jason Hanna, Mallory Simon,Tricia Escobedo, Chuck Johnston, Alan Duke and Chris Welch contributed to this report. Hopefully he/they will be made to cut their beards before entering prison–what a fitting punishment. I find it sincerely sad that men that were stood for devoutness and claims to live the simple life for the efforts of fullfilling a higher calling – lost themselves to petty emotions such as... what lead them to do what they did. I hope one day they can see their slow spiral into losing who they once were... Many think the world is so very large and big – you are sure to be lost in it – but these men proved you can also be lost in a forest – when you follow the guide – who is lost but so very sure – they know the right path. We can see that he did not – and he took all of his kin down this same road of hatred. When Romney was a high school student, he bullied a younger, smaller gay boy and cut off his hair. Is that not a hate crime? Convictions like this make my heart sing! Mullet and Miller- not all related. I guess the gene pool is small in the Amish community huh. You read this and yet children are committing suicide from bullies which communities and schools do nothing about. Lovely. THE ELDER SCROLLS SERIES IS AMAZING!!!!!!!!!!!!!! ITS SO MOVING IN EVERY ASPECT, ITS ALMOST AS GOOD AS TWILIGHT AND SKYRIM! !